We are a blended family that ranges from having 2 people in the home… up to 9 people in the home. When it’s just the two of us, things don’t tend to get too out of control. But as the numbers rise, it’s amazing how much it looks like a tornado made its way through the home. Another thing that blows our mind is how everyone can be getting along so well… until we start asking for some, ‘help around the house.’ Some days it seems like wars break out. Sides are chosen… enemies unified behind… all because nobody can claim responsibility for the LaffyTaffy Wrapper in the middle of the floor. It seems as though hours can be spent debating and fighting about the smallest things… when… work… is… requested. The temptation as parents is to throw the hands up and just do it ourselves… ’cause it would be a whole less dramatic than watching teens and children, who may have to put their technology aside for 15 minutes a day to help out around the house. 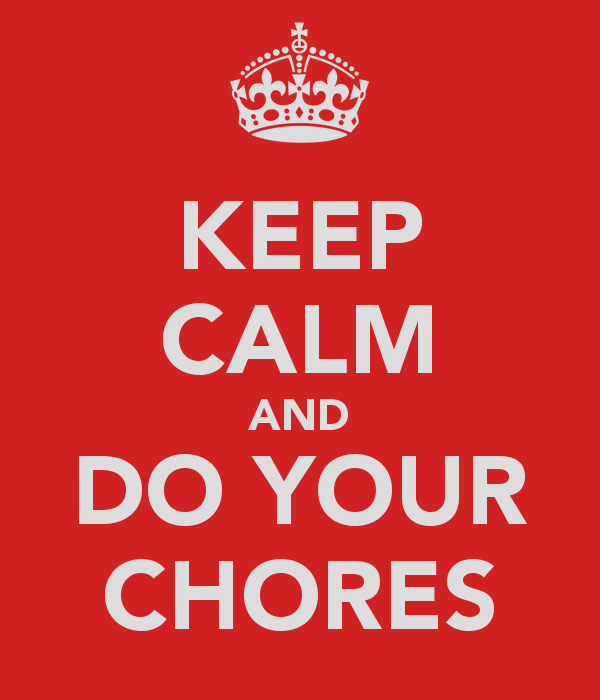 Consider this… in all the minutes that are given to us each day… a 15 minute chores is barely over one percent of all the time you have to spend that day. But… consider this: in our house of 9… if everyone chips in 15 minutes of work per day… that is over two hours of time spent keeping things in order… and uncluttered. There should be no reason for any work to be done on the weekends when all that work is being done throughout the week… right? Well… the reality check, is that if we aren’t intentional about the day to day of running a home, things can get out of control. That’s why it is important to have some sort of plan… communication… and a common direction in the home for keeping things clean and uncluttered. Attached here is an empty example of ChoreChart that we rotate different people into week after week. We are not perfect in this area by any stretch… and many days still believe it would be easier to just do it ourselves… but that isn’t what parenting is all about. Enjoy the battle.